Tissue alert! Tissue alert! Seriously! Grab the Kleenex! 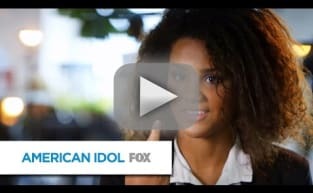 Tristan McIntosh, 15 years old, is bringing the tears on American Idol Season 15. Singing before the judges in Little Rock, AK, McIntosh moved them all to tears with her song and her story. Okay, let's be real. She moved everyone watching to tears, too. Seriously. Sitting here in my living room and a dust storm must've blown through the place or something! Big, fat crocodile tears went streaming down my face and right into my coffee. Tristan's mom, a Major in the United States Army, is her daughter's "big hero," and she was called away on a deployment shortly before Tristan was set to audition for Idol's final season. Devastated, but determined to make her mother proud, Tristan sang "Why Baby Why" for Harry, Jennifer, and Keith after sharing with them a little about her mother and the bond they share. She made her mother proud, alright. Holy moly, did she ever. Harry read an email from Tristan's mother after the teenager performed and...just...you guys...goosies for sure! It was THE feel-good moment of the night! Especially when TRISTAN'S MOM SHOWED UP! Amazing performance and a family reunion? Even Fox News commentators would cry at that! As Tristan exited the room, J.Lo declared her the one to beat for American Idol Season 15. Harry was inclined to agree. After watching her audition, I'm certainly rooting for her.